All of our students and faculty practice the Transcendental Meditation® technique — brought to the West by Maharishi Mahesh Yogi — to develop their inner potential. Extensive published research has found that this technique boosts learning ability and creativity, improves brain functioning, and reduces stress. a. What is the Transcendental Meditation technique? It is a simple, natural, effortless procedure practiced 20 minutes twice each day while sitting comfortably with the eyes closed. It’s not a religion, philosophy, or lifestyle. 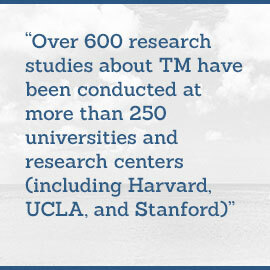 More than six million people worldwide have learned the TM technique — people of all ages, cultures, and religions. b. What happens when you meditate? The Transcendental Meditation technique effortlessly allows your mind to settle inward beyond thought to experience the source of thought — pure awareness, also known as transcendental consciousness. This is the most silent and peaceful level of consciousness — your innermost Self. In this state of restful alertness, your mbrain functions with significantly greater coherence and your body gains deep rest. c. How do you meditate? It is practiced for twenty minutes twice a day, sitting comfortably with the eyes closed. The technique needs to be learned from a certified Transcendental Meditation teacher. UMLAC students receive TM instruction shortly after their arrival. Academic credit is given for the Development of Consciousness course — this required course supports the regular and correct practice of the TM technique. d. Is there scientific research on the TM technique? Over 600 research studies have been conducted at more than 250 universities and research centers (including Harvard, UCLA, and Stanford). These studies have been published in more than 100 journals. The National Institute of Health has awarded more than $25 million for research on the effects of the Transcendental Meditation technique on health, especially cardiovascular health, and helping college students cope with stress. e. Where did the TM technique come from? The Transcendental Meditation technique is based on the ancient Vedic tradition of Indi a. This knowledge has been handed down by Vedic masters from generation to generation for thousands of years. In 1959, Maharishi Mahesh Yogi — the representative in our age of the Vedic tradition — introduced the Transcendental Meditation technique to the world, restoring the knowledge and experience of higher states of consciousness. f. How is the TM technique different from other forms of meditation? A meta-analysis of 597 studies covering most meditation and relaxation techniques was published in the American Journal of Health Promotion (12:297-299, 1998). The study found the TM technique to have markedly better results in a wide range of criteria related to cognitive function, self-actualization (growth toward one’s potential), and mental and physical health. g. What if I practice another meditation technique? Before coming to UMLAC, some of our current students practiced other meditation techniques for self-improvement. To avoid the risk of mixing procedures — which could compromise the naturalness, effortlessness, and effectiveness of the Transcendental Meditation technique — we ask that all students practice only the TM technique. Our admissions counselors would be happy to discuss this further with you. h. How can I learn the Transcendental Meditation technique? New UMLAC students are instructed in the TM technique within a few days of arrival, and all U.S. students receive scholarships covering the full TM course tuition. If you are interested in learning meditation before coming to UMLAC, please visit the Transcendental Meditation website to find out how to learn. i. Are scholarships available for the TM course? Yes. The David Lynch Foundation provides all new undergraduate students and all U.S. graduate students at UMLAC with a scholarship covering the full tuition for the TM course. International graduate students receive a loan for the tuition of $625. U.S. students who learn the TM technique at a TM center after applying to UMLAC but before enrolling will receive a reimbursement for the student tuition ($750 maximum). j. What is the TM-Sidhi program? The Transcendental Meditation Sidhi (TM-Sidhi) program is a simple, natural, effortless set of procedures that accelerate the personal growth you gain from the Transcendental Meditation technique by itself. As scientific research studies have show, the TM-Sidhi program brings faster growth of creativity, learning ability, physical health, and psychological well-being. One of the TM-Sidhi procedures is called Yogic Flying, which leads to the body lifting in short hops from the ground. Students describe the experience of this technique as one of happiness, energy, bliss, and inner freedom, with these qualities carrying over into their daily life. EEG measurements show that during the practice of Yogic Flying there is a marked increase in brain wave coherence that coincides with the body lifting up. 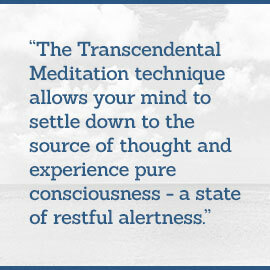 The Transcendental Meditation technique allows your mind to settle down to the source of thought and experience pure consciousness — a state of restful alertness. The TM-Sidhi program trains you to think and act from this most silent and powerful level of the mind. The TM-Sidhi program was brought to light by Maharishi from the Yoga Sutras of Patanjali, from the ancient Vedic tradition. When people practice the TM-Sidhi program in groups, they create a powerful effect of harmony and coherence that radiates into the surrounding society. Scientific studies have found that such groups have reduced crime rates, accident rates, and sickness rates. When open warfare is present, such groups have even reduced fighting and war deaths. Scientists have termed this phenomenon the Maharishi Effect. UMLAC is committed to creating and maintaining a group large enough — 2100 Yogic Flyers — to create coherence and improve the quality of life for whole Latin America and the Caribbean. With this technology of consciousness, we have the practical possibility of creating permanent world peace.